Rhythm Swing | Tap for your life! From the creator of Flashnote Derby comes a fun and educational app for iPad and iPhone. Kids learn about rhythm and how it is written with music notation. Over a dozen video lessons are included right inside the app. Learn about each new type of note, what it looks like, how it works, and then try a couple of easy examples to help you understand it. Practice hundreds of rhythms until you master each new concept. Helpful feedback will guide you in fixing any mistakes. 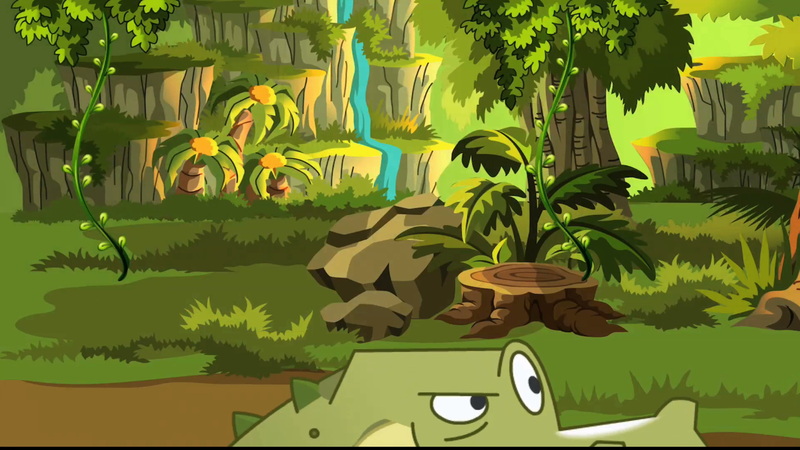 When you’re ready, see if you can guide Quaver the monkey past the hungry crocodile to his hidden banana stash! 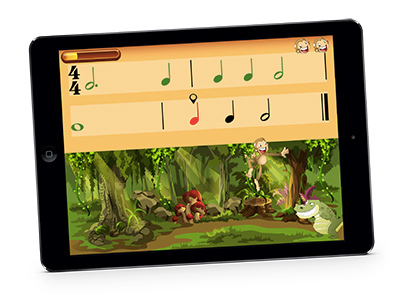 Get Rhythm Swing today for your iPad or iPhone! After playing with Rhythm Swing for awhile my students and I have grown to enjoy it. Most of them like the practice section better than the game because they feel less pressure but eventually they all get around to playing the game. I have all positive things to say about it so far… Keep up the great work! This is a great app. I am using it with beginners. It helps to maintain the steady beat …at different tempos. 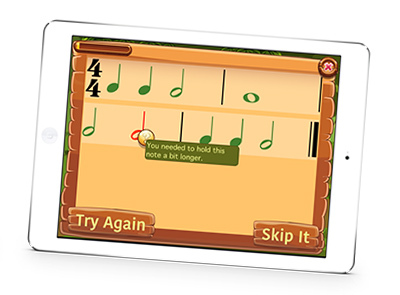 What makes it different from other rhythm apps is that it requires holding half notes for two full counts, it progresses slowly enough to use with beginners and it uses different tempi in each level. Thank you! My students and I LOVED Rhythm Swing. It was a real eye opener as to which of my students could instinctively keep a steady beat.